The Bialetti Moka Pot and Cafe Bustelo, an Italian and Cuban-American collaboration resulting in beautiful coffee. There are many ways to buy a cup of coffee, and also many ways to make a cup of coffee at home. One device that you will probably find in any Italian kitchen is an old, seasoned, hard-working Moka Pot, more often than not, made by Bialetti. The Moka Pot is a simple, tough, long-lasting device that when paired with a domestic cooktop and some nice, fresh, finely ground, dark roasted coffee will produce a cup of brew that has very little acid, no bitterness, and none of the other negative attributes that many coffee drinkers put up with, because they just became used to it. In the United States, most coffee brewed at home finds it’s way through a paper filter. Even if it comes from a Keurig capsule, there is a filter inside that. However, paper filters take something vital out of coffee. They remove a quality of taste that can only reach the tongue if it never sees any paper filter on it’s journey from grinds to mouth. I think that one reason the moka pot has such a small footprint in America, is that it bears a superficial similarity to a diabolical coffee-ruining device called a percolator which was popular between 1950 and 1980. The percolator used to pass the brewed coffee back through the heat, and back over the grounds, over and over again, until you eventually stopped it, which guaranteed a burned and over-extracted flavor and a rancid oil buildup in the tube. The Moka Pot does not do that. Only water goes through the grinds, and only once, but still the unfortunate resemblance remains. Then there is a misnomer. The Moka Pot is often described as a “stovetop espresso maker”, but it is incapable of producing actual espresso. Don’t get me wrong, espresso is a beautiful drink, and the jewel in a true coffee lover’s diet, but a Moka Pot is not a tool for producing it. There simply is not enough pressure involved. And incidentally, espresso itself is under threat in America as the “creative” owners and managers of modern cafes use incorrect types of coffee and incorrect levels of roast to present strange fruity shots that would have them laughed out of town if they tried such a stunt in Rome. The ideal cup of coffee from a Moka Pot is strong, clean, dark, hot, black, but does not have the crema of espresso, or any foam or bubbles. In America, we are so used to Starbucks, The Coffee Bean and Tea Leaf, Peet’s etc., that we have begun to think it is normal to pay more than $12 for small bag of coffee to take home and murder with our drip coffee makers and paper cones. But right there in the supermarket, just to the left of the low quality Folgers, Maxwell House and Choc Full o’Nuts, is a bright yellow can containing vacuum-sealed goodness. Ten ounces of finely ground Cuban-style coffee that is just dying to get in your Moka Pot and provide you with the perfect cup of brewed coffee. This magical yellow tin is of course Cafe Bustelo, and it only costs about four bucks. The Italian Moka Pot and this Cafe Bustelo coffee are a great team. In the right hands and with hardly any practice, they can come together to make possibly the best cup of coffee you have tasted, and still cost you less than the terrible mainstream paper-wiped swill that most unfortunate Americans still think of as normal. 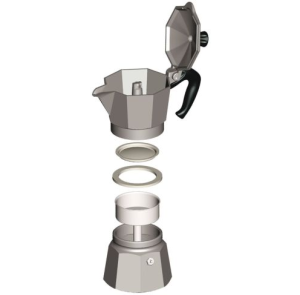 The traditional Moka Pot is made of aluminum, and it only looks new once, when you take it out of the box. It is important to never put it in the dishwasher or wash it with powerful soap, or use any abrasive pads. In fact you can just wash it in cold running water, and if it sits unused for a while, (unlikely), you can freshen it up with boiling hot water. A misguided run through the dishwasher removes the anodized coating, and turns it from shiny silver to an ugly dull gray. It can then only be restored with polishing, and then that poisonous polish can only be used on the outside parts. There are also more expensive stainless steel versions which you can clean any way you like. But the original aluminum classic is what you find in almost every Italian kitchen. Bialetti is the prominent brand, but there are several. Bear in mind that if you have an induction cooktop, an all-aluminum Moka Pot will simply remain cold! Using online stores you can bring the best Moka Pot home for just over $20 no matter where you live, and also obtain replacement gaskets etc. Cafe Bustelo is a commercial ground “espresso blend” coffee that is a dominant brand amongst American users of the Moka Pot. It makes your cup an international affair, because while the Moka Pot is Italian, and in many cases still manufactured within Italy, Bustelo was a Spaniard who emigrated to Cuba, then moved to Puerto Rico, and so became an American and managed to relocate to New York City and become a coffee-roasting entrepreneur. 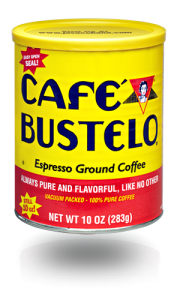 You could, and should, try all kinds of coffee in your Moka Pot, but your first can or brick of Bustelo is the ideal place to start. For methodical guidance, simply watch YouTube videos and see how even the most challenged YouTubers can do it well enough to be inspired to broadcast it. It is really easy. 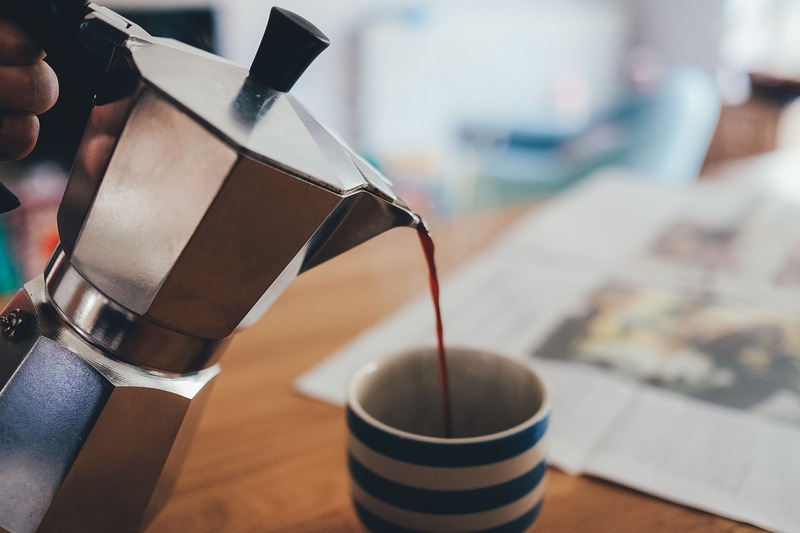 Adding a Moka Pot to your collection of drip machines, French presses, capsule and pod machines, home espresso rigs and whatever else you have around, will be something you can do very inexpensively, and you may find that it is the sole method that will stay with you for life, whether you are at home or at a campsite. All those Italian homemakers cannot be wrong. You’ll see.